This week I want to spend some time with Fantastic Heroes & Witchery. Full Disclosure: I have worked with the author, Dominique Crouzet, in the past on a couple of projects. I think Dom is a great guy and I love the work we had done together. I am going to review FH&W on it's own merits. For this review I am looking at the PDF copy found at DriveThruRPG and the print copy hardcover from Lulu. 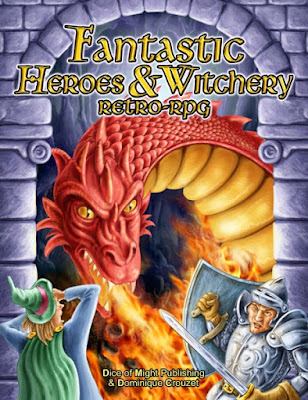 Fantastic Heroes & Witchery Reto-RPG (FH&W hereafter) is a newer "retro-clone" of the classic D&D rules. The book itself is a massive 430 pages. This includes the table of contents (4 pages), index (4 pages), spell index (4 pages) and OGL statement (2 pages). The PDF also has a "quick click" index to get to sections in the book faster. 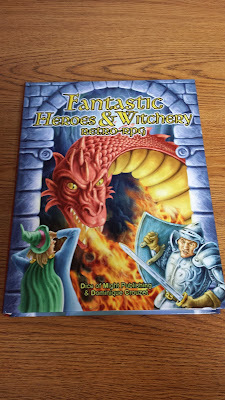 A while back I referred to this as the "Rosetta Stone" of OSR games. It still works like that, but this really more of an meta-analysis of OSR RPG elements put into a cohesive whole. The game feels like Basic era, BEMCI, D&D, but it also has the options of both 1st and some of 2nd Ed AD&D. Other games like Swords & Wizardry have also contributed to the DNA of this game. A quick look at the OGL statement in back makes it clear that this game is very much a product of many, many games. This is not a slight, there is an absolute ton of new and original material here. It takes the best and develops more to make it all work well. In fact this book is a good point of translation between the various clones and 3rd Edition. Not that translation is difficult, this helps smooth out the "local idioms" to some closer to normal. A note about the art. Dom is not just the author of this game he is also one of the primary artists and graphic designer. The art is reminiscent of both B/X D&D and AD&D, on purpose. In fact there are a few tongue in cheek references to old AD&D books. To further this feeling there is also art by Jim Holloway. Chapter 1 deals with character creation. Here we are given the details about Ability Scores (OSR standards here) and then we get into races. The usual suspects are here, but some of the newer folk as well like tieflings, and some new ones. The new races include tainted humans, primates, reptilians, revenants (undead), winged folk, and witchlings. I love the idea behind the primates, intelligent apes and wonder why we have not seen more of those in other fantasy games. A personal aside, the Witchlings are very much something I would expect out of Dom. I am very intrigued by the race and plan on exploring in more. The next section of the chapter is Character Backgrounds. These are more role-playing options with suggestions of mechanical advantages (Foresters are better at climbing trees for example, but no pluses are given). This is a nice section that does better than it's inspired materials but doesn't quite go as far as the newest edition of the D&D game. That is likely a perfect sweet spot for the types of games that are going to be played here. We end with a discussion on alignment. Chapter 2 discusses character classes. We have the expected list and then some more. Again since this is a merging of Basic and Advanced ideas there are some "racial" classes here. I like the idea myself and will discuss those in a bit. There is also a section on "Weird Tales" pulp-era classes. 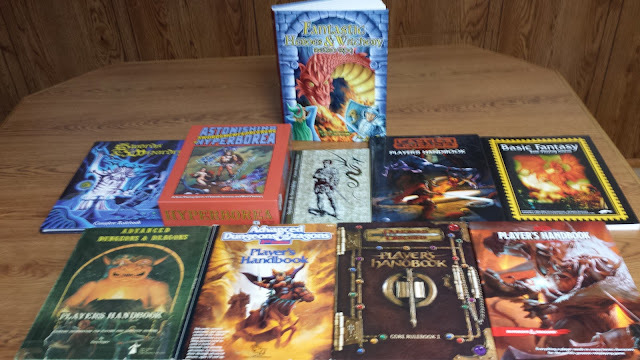 Classes are divided up into groups much like 2nd Ed or Astonishing Swordsmen & Sorcerers of Hyperborea. 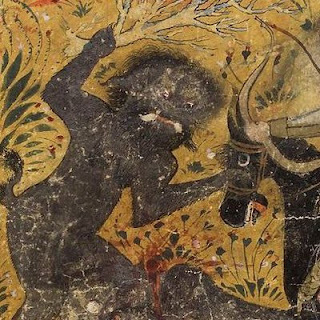 We have Warriors which include Fighters, Beserkers, Knights and Ranger. Rogues which include Thieves, Acrobats, Assassins, and Bards. Divines which consist of Friars, Mystics and Templars and the racial classes. 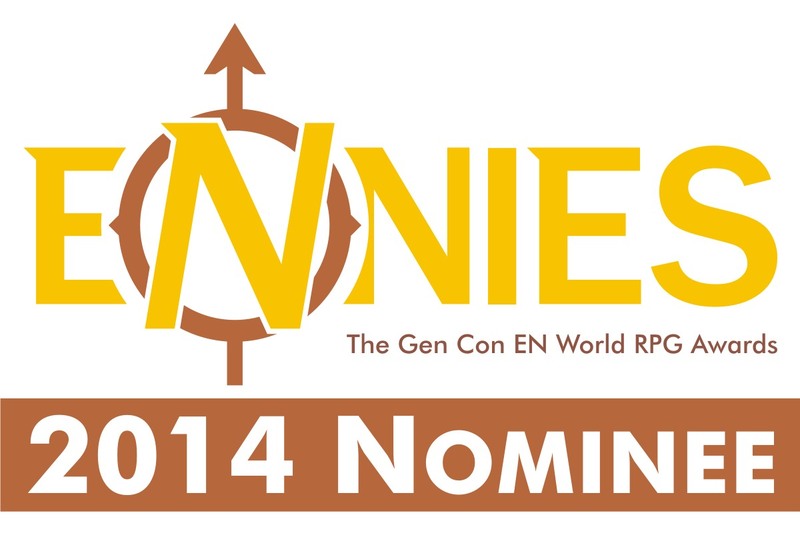 Dwarves include Clans-dwarf and Gothi. Elves are split into High and Sylvan they include Eldritch-archer and Fae-mage (High) and Forestal and Warden (Sylvan). Gnomes get Illusionist and Trickster. Halflings get Folk-champion and Scout. Finally there are the Weird Tales classes; Necronimus, Occultist, Psychic, Rifleman, Savant, Sky-lord, and Wild-brute. Like editions 3.x and beyond, all classes use the same Experience Level chart. So 2,000 xp is 2nd level for everyone. This has a number of nice benefits including easier multi-classing. Like newer editions each character class has a base to hit modifier. So for fighters this goes up +1 per level. Each class has HD, Base to Hit, Saves and abilities per level. Saves are standard Sword & Wizardry style, but there is an Appendix for conversions later in the book. An note about levels. Like B/X, AS&SH or Adventurer, Conqueror, King, FH&W assumes that 13 is the max level. There are XP values given for 14 and above, but the abilities stop there. I will discuss the Wizard classes later when I talk about the spells, but for now I want to say that racial classes are really some of the nicest new classes of the book. It is easy to create a bunch of human centric classes, but these different cultures would naturally produce some professions or heroes of their own. The Weird Tales classes are an interesting bunch. Some would fit right in with the Ranger or Knight, others, less so. The Necronimus is basically a spiritualist or speaker of the dead. The occultist learns spells as the find them from old tomes, the psychic is what is says on the tin. Others like the Rifleman or the Savant (aka Weird Scientist) could work with some good role-playing and a lot of help from the GM. The Sky-Lord...is a great class, but it is very Sci-Fi or at least Sci-Fant. The wild-brute would work anywhere to be honest. Hit-dice and hp are discussed in the next section as well as saving throws. The model of saving throws in the Swords & Wizardry one but also it could be said the D&D 5 one or the Castles & Crusades one. Conversions and notes are given for how to translate a Fortitude save or a Breath Weapon save over to this system. Honestly this is a gem and worth printing out these pages for any game you play. Next are skill checks and how to handle them. Chapter 3 covers Equipment. This is what you expect but there is a lot to choose from here. In fact t might be one of more comprehensive collections. Worth the price of the PDF to be honest to have all of this in one place. The section on Sci-Fantasy equipment is an added bonus. Chapter 4 details Combat. There is your garden variety melee and missile combat, but also vehicle based combat and psionic combat (for the psychic class). Stuffed in the last paragraph is the very interesting Duels of Rhetoric. Basically, combat of words. There is a lot of potential here and something I want to use in my next D&D5 game. Yes it works with any version of D&D or OSR game. Chapter 5 is Moving and Exploring. A lot of what becomes a goo dungeon crawl is more than combat. This also details carrying capacity. What you expect is here, but there is also a nice section on "Chase rules" to go with your vehicle based combat. Suddenly I want to do a Stephen J. Cannell-style chase with chariots or even dragons! These two chapters have a logical conclusion found in Chapter 6, Hazards and Injuries. This includes a Wound and Vitality system for use in any D&D-like game. Other topics include massive damage (like AD&D 2), subdual (a feature of my Basic D&D games) and healing. There is a section of Threats and Hazards. This details a lot of conditions PCs can find themselves in; Blind, Fearful, Drunk, Poisoned and so on. Congrats, we just worked in the best parts of D&D4! Beyond that the Conditions/Afflictions also extend to the Supernatural. So Energy drain, Lycanthropy and so on. Chapter 7 covers Monsters and NPCs. There are no monsters in FH&W. Not that there can't be, but the book does not list them. It does talk about how to use monsters and how NPCs can also work as monsters. By default FH&W assumes an OSRIC style stat block for monsters. Chapter 8 is an interesting one. It covers Priests and Religions. Different types of world views are discussed. Also the priest classes are mentioned with different "templates" one can use to make the priest feel different. Some concepts of gods are later detailed. One could add names to these from any myth rather easily. Names are not provided though. Each God archetype also has a suggestions for their clergy. After this we get into a discussion of Law vs. Chaos. This includes another class, The Agent of Law/Chaos. If you are thinking Elric or other Eternal Champions (but also I will add, He-Man from the Masters of the Universe media is a great example of an Agent of Law). In fact so engrossing is this concept I might create three agents using this as my outline for Law, Chaos and Neutrality. If you pick this up, really consider this chapter and what it could mean for your game. There is even a treatise on the immortal soul and some details on the outer planes. Chapter 9 covers magic and spellcasting. There is a lot here. One of the better sections is acquiring arcane spells. There are equally as good sections on getting spell-like powers. Also covered is an optional rule on Incantations, which are spells that anyone can use. As expected the schools of magic are covered, with the different specialists such as Illusionists, Necromancers and so on. Also presented is a War-Mage class. The next section deals with the craft of magic. This includes a lot of information on magic circles, scrolls, and even creating magical talismans! My favorite is part on ley lines and power nexuses. We get into the bulk of the chapter with spell lists by class. Spells are divided into Psychic, Gray, Black and White magic, Nature and Delusion spells. Chapter 10 is the Alphabetical listing of all the spells. 164 pages worth of spells, 666 spells in all. Thats 2/5s of the entire book. I know some are new, but I would have to read each in detail to know which ones. There are a lot here in any case. Personally I LOVE that the Mordenkainen's spells have been changed to Morgane's. While many of the spell casting classes stop at level 6, these spells do go to 7th, 8th and 9th levels. Appendix 1: More About Ability Scores. - Ability scores above 18 to 25. Appendix 2: Physical Appearance. - height and weight by race. Appendix 8: Sanity / Insanity. - I am not a fan of sanity in a FRPG. but this is a simple solution option. Appendix 9: Skills in More Detail. Appendix 10: Talents (Custom Abilities). Appendix 11: Fighting Schools and Maneuvers. Appendix 12: Adding More Character Classes. Appendix 13: Epic Levels (14th to 20th / 25th level). takes the characters into epic levels, in this case 14th to 25th. Appendix 14: More About Saving Throws. - more Saving translations. Appendix 16: Critical Hits (Complete Table of Secondary Effects). A bit more about Appendix 12. This is a GREAT section about adding other classes including 3e prestige classes. This includes note on how to add my own Witch to this game. There are also more classes here including: The Adventurer, the Animist, the Scary Monk (the monk from AD&D), the Sea-Dog, the Sea-Witch and the Thick Brute. 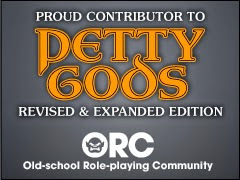 We end with the OGL notice and a character sheet. What can I say at this point really? This is an awesome resource. It is a great game in it's own right, but it shines when added to other games. Use this to play an OSRIC game while importing some 3.x style classes and as Swords & Wizardry monster book. Or whatever you like. There is so much here that there is no end of what you can do with it. A serious high mark for all OSR products in terms of utility. Tim your finally getting around to this pal? Given your gaming style, abilities in DMing and the rest of your experiences I'm very surprised that it took this long. Great review for a fantastic game. Cheers Tim, hope you actually get to use this one. IT should give you an indication on how far behind I am in reading new products!